On the island of Crete – besides being a very fine holiday destination – there is much to see as regards icons and frescoes. You could say that it is a ‘mecca’ for icon painters. Particularly in the western part of Crete, you can find many small churches and chapels decorated with icons and frescoes. 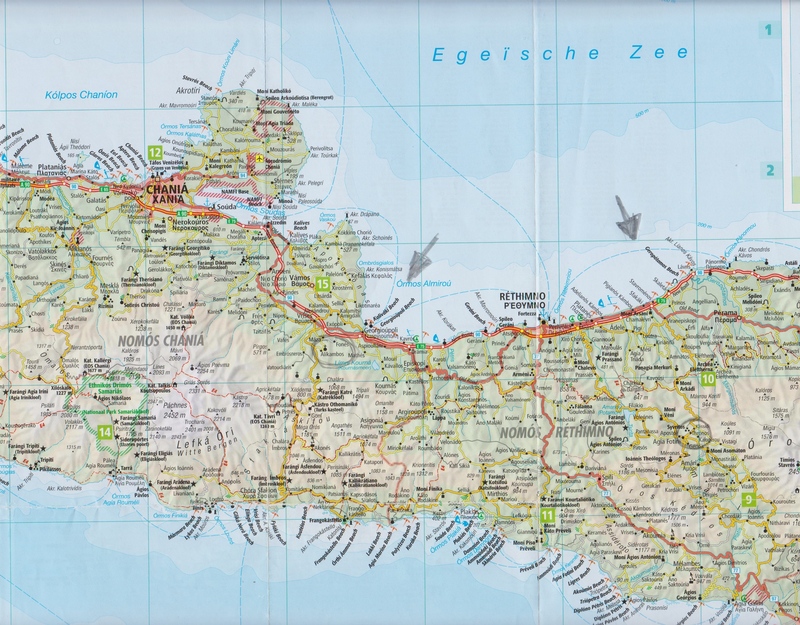 A rental car is more or less necessary as is a good, detailed map (Fig. 1). Visiting these remarkable religious sites is challenging and requires patience and initiative on the part of the traveller. 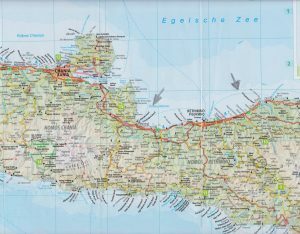 Although some are listed in guidebooks, that does not necessarily mean you have reached your goal, as nearly all of them are located deep in the interior of the island. Many are so small that it is easy to miss them even when you think you are carefully following the road signs. Often the signposts or indications are in roadside ditches or even obscured by undergrowth. Most of the buildings are similar in size; about 3 x 7 meters and 3 meters high. Some are very remote and can only be reached on foot. To trace the origins of the frescoes in these churches, we need to go back to the 13th and 14th centuries and the decline of the Byzantine Empire and its capital, Constantinople. With the deterioration of the Eastern Roman Empire, Greek artists moved to safer places such as Cyprus and Crete, then under Venetian administration. 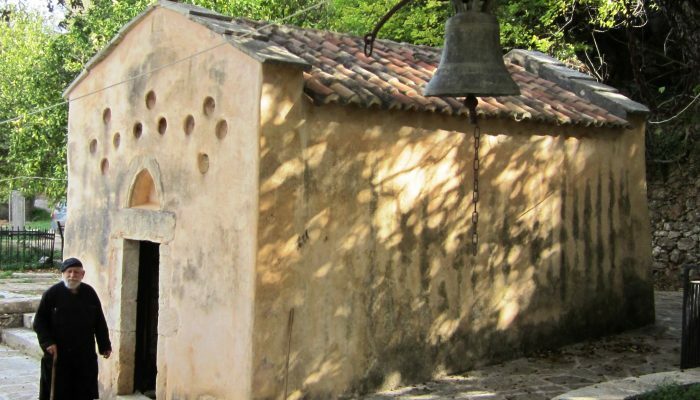 In this article, I have focused on two comparatively well-known churches in the areas of ​​Rethymno and Georgioupoli, both easily accessible by car. 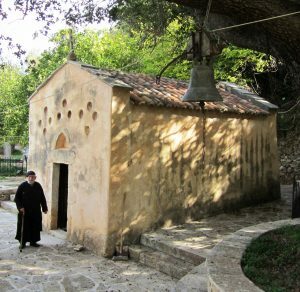 In the Amari Valley southeast of the city of Rethymno, is the church of Thronos, dedicated to the Assumption of The Blessed Virgin. You can secure a key from either the caretaker or the café adjacent to the church. Please respect that it is forbidden to take photographs inside the church (Fig. 2). The walls are completely covered in marvelous frescoes, painted by local artists who made generous use of indigenous dyes. The church was built in the 14th century, around 1315. The current church stands on the foundation of an older, larger church, which likely dates from the 6th century. On the plateau in front of the church, the remains of the old floor mosaics are still visible. Upon entering the church, one is overwhelmed by the striking frescoes that cover every part of the decorated walls. Furthermore, given their age and the circumstances of time, they are remarkably well preserved. The small iconostasis is most likely from a later period. The iconic Pantocrator dominates the apse, with the Hospitality of Abraham placed under the Christ figure. Along the side walls are several biblical scenes such as the Blessed Mother with Child and the Transfiguration. Above the church entrance, on the inside, we can see Mary in the Orante posture. Travelling from Georgioupoli to the imposing Imbros Gorge, there is a small chapel situated near the cemetery at the bottom of the slope of the valley – at the height of the village of Alikambos. Access to the church requires picking up the keys from the pastor in the neighboring village. He then accompanies visitors to open the door and must be brought back to the village after viewing the chapel. A small stipend is expected for this service. The church’s bell hangs from the large tree in front and, upon entering the chapel; one is invited to view the frescoes covering the entire interior. They are the handiwork of local artist, Ioannis Pagomenos. This church also dates back to the period around 1315. Photography, without flash, is permitted inside the chapel. In the apse is a wonderful fresco of Mother of God of the Sign. 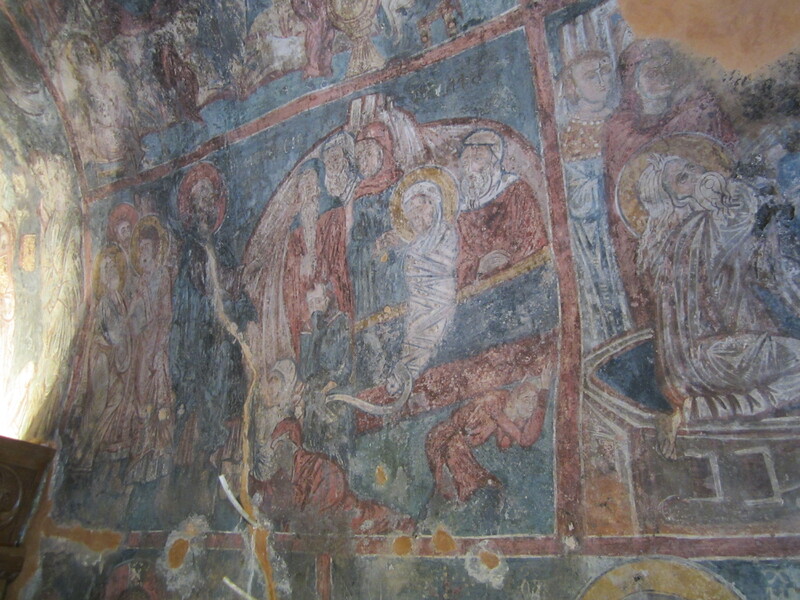 Along the walls are representations of, among others, Adam, Lazarus and the Pantocrator (Fig. 3). The noteworthy and unique holes in the outside wall above the chapel door, according to the pastor, are a reference to the twelve apostles. However, because Judas is not included in the group, there are only eleven holes to be seen. I asked myself, was he making a joke or is it the truth? I must say, I had my doubts. But there is no doubt as to the value of a visit to Crete and its fine Byzantine churches!